The Phoebe Diabetes Resource Center is a comprehensive diabetes center that provides family-oriented patient care and education for those with diabetes to help them manage their disease. Diabetes is a silent killer. More than 20 million Americans have this deadly disease. One out of every three people with diabetes is unaware they have it. According to the American Diabetes Association, that amounts to nearly 8 million Americans. Are you at risk? 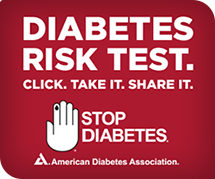 Take the Risk Test from the American Diabetes Association. The Diabetes Resource Center, recognized by the American Diabetes Association has individual and group services available for patients and their families. Our expert team of registered nurses and dietitians provide the most up-to-date knowledge and skills along with compassionate support.